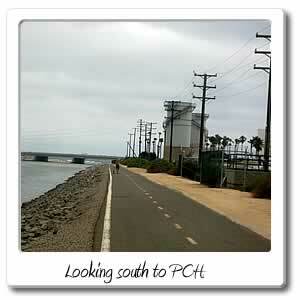 Welcome to Pacific Coast Highway going North and South on the Santa Ana River bicycle trail. 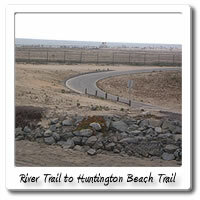 The section of Pacific Coast Highway that goes through the Southeast corner of the City of Huntington Beach is also, the Southern most entrance, with mile marker 0 starting after you get onto the path to the 29 mile Orange County section of the Santa Ana River Trail. The Santa Ana River bicycle trail or the Santa Ana bicycle trail, are the two other names people call the river trail that starts on the West bank of the Santa Ana River and next to the river mouth, which is where all the river water empties out to the Pacific Ocean. Other names for the trail, also include the Santa Ana riverbed, or the Santa Ana riverbed trail. Some people also know it as the Santa Ana River Trail and Parkway. The trail is also a National Recreation Trail. PARKING IS AVAILABLE at the Huntington State Beach parking lot, located at Brookhurst Street and Pacific Coast Highway, but you will have to pay to park your car at this location. Riding your bike in is free. You can save on parking costs, by parking for free on Brookhurst Street, just before reaching Pacific Coast Highway. To get to the trail from there, head South on Brookhurst Street, cross Pacific Coast Highway, and go through the parking lot, once you see a trail, to the East you can easily find the beginning of, the Santa Ana River Trail. If parking along Brookhurst Street, very shortly before Pacific Coast Highway, you can find the entrance to the Talbert Marsh which will take you to the Santa Ana River Trail and then you can go South to Pacific Coast Highway. If you're riding your bike from the Huntington Beach Bike Trail, or from Newport Beach, to access the beginning of the Santa Ana River Trail, will mean you will have to spiral around before you go under the Pacific Coast Highway bridge. At about the same time, there is a blind curve which is under the bridge, so make sure you stay to the right and be careful. It will quickly straighten out and start going North but you have to go 100 feet before the 0 mile marker for the Santa Ana River Trail actually begins. There's also warning signs that this area will also flood, when it's the rainy season. For FOOD and DRINK, there's not much available around by Pacific Coast Highway. During the summer, you can go West on the Huntington Beach bike trail, and find the shacks that sell food. Another option is a small little strip mall with shops, including a pizza place and maybe a liquor store, that is on the corner of Brookhurst Street and Bushard Street. You can get there by going North on Brookhurst Street for .3 miles, that will take about a minute of bike riding to reach. You can get to Brookhurst Street by getting off the Talbert Marsh Trail or shortly after the Huntington Beach bike trail starts. On the East bank of the Santa Ana River, which is in the City of Newport Beach, there's another trail,Banning Channel Bikeway. This trail is across the river from the Santa Ana River Trail. 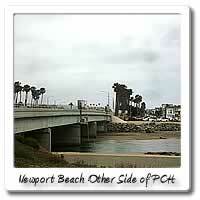 It begins after going North under the Pacific Coast Highway bridge. This paved trail, takes you North for 3 miles until you merge back into the Santa Ana River Trail by the Talbert Nature Preserve. 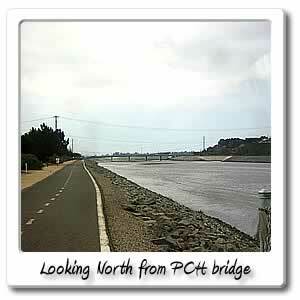 also see that same page for the trail, that's called the Banning Channel Bikeway. You have to pass Pacific Coast Highway to get onto that trail, going North. Getting back to going North on the Santa Ana River Trail, 410 feet after the 0 mile marker and the white strip that says "start" is the next entry point, which is Talbert Marsh Trail and is right next to the chain link fence and the covered shelter, bench and kiosk on the left hand side when you're going North. At the end of that trail, is Brookhurst Street, which is the major street running North and South for 17 miles from the City of Huntington Beach and going up to the City of Fullerton. As far as the next major street going East and West, crossing over the Santa Ana River Trail is the Hamilton Avenue/ Victoria Street bridge. It is 1.3 miles from the beach and about a 7 minute bike ride. Hamilton Avenue runs West through the City of Huntington Beach. On the other side of the Santa Ana River and the Santa Ana River Trail is Victoria Avenue which goes East through the City of Costa Mesa. 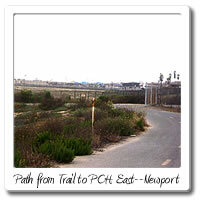 This picture shows the bike path from the trail to Pacific Coast Highway heading east to Newport Beach.